La Sierra Hostel i Santa Marta, Colombia: Reservér nu! Walk into this vibrant city nightlife or just chill in our rooftop bar restaurant overlooking the in-house pool surrounded by a breathtaking view of the colonial neighborhood. We are proud to have one of the biggest and most comfy bunk beds around; double mattresses with blinds, light and power outlets on each bed. Located in the heart of the Historical Center, near the Cathedral Basilica of Santa Marta we are surrounded by the most exclusive bars and restaurants the city has to offer. 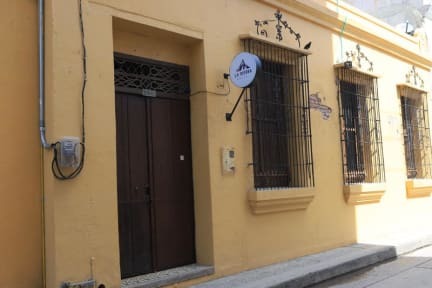 La Sierra Hostel offers a direct access to the colonial narrow streets of the city center beautifully filled by youthful restaurants and bars. We offer everything in one place, bar and restaurant on the roof terrace with the best ambiance, spotless view, food and drinks rich on Caribbean flavors lots of celebrations with live music and parties. Come to La Sierra to chill out by the pool, find a quiet reading spot, eat nice food, drink a tropical juice, cocktails or join in our daily cultural activities. Taxes not included - tax 19 % per person per stay. - Enjoy your stay! relax and keep special memories of this holiday. Please be aware of the following hostel rules and advice. -We invite you to make a good and respectful use of the premises, respect and follow the rules as these are for your and everyone else benefit. La Sierra is under high standards to offer you a comfy stay. - Smoking in the rooms and consumption of narcotic drugs in front or within hostel premises is strictly prohibited. You can enjoy a drink in common areas like reception, bar/restaurant and pool with some restrictions. -Visitors are allowed to stay in common areas only. No overnight guests are permitted in guest’s rooms. -Bed linen and Towels. On your ‘check in’ we provide a welcome package with (towel, clean bed linen, spare key for lockers). Please take care of these, avoid marks, stain, damage or lost as this might be paid back from your deposit. (Kitchen) we provide a nice comfortable kitchen space to cook practical and easy meals. Please use all appliances and utensils with care and wash them properly after use. This is so other guests can also use them. Food in the fridge must be stored with care of expired dates. Our House keeper will help with the maintenance but is your responsibility look after your food and leave the place as you found it. (Bathrooms)- (Ladies- Gentleman’s) We appreciate respect and proper use of bathrooms and other guests. (Pool)- Fell free to use and enjoy our central pool. Opening time is from 8 am to 10 pm. Refrain to take glass bottles of alcohol are allowed. - We kindly ask to avoid any source of noise after 10PM near guest rooms. This will guarantee proper rest to ours guests. Be careful when moving luggage, closing doors, loud music or television late in the evenings. - No parties or late meetings that might bother other guests are allowed, in rooms. - Our Staff is very friendly and will do everything to help you out! Please let us know always if you need something so we can quickly assist, call us no matter the time, we will be happy to help. 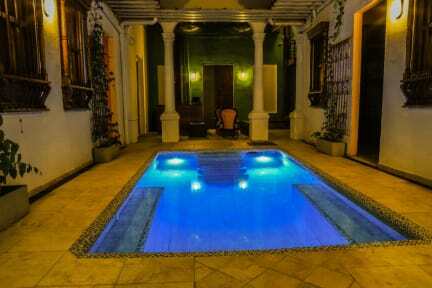 - Advice on Tourism attractions and packages to explore Santa Marta are also available in reception. We have some of the best deals within the city! - All appliances and services in La Sierra are in excellent conditions. We appreciate report any damaged item on time at the reception.